Published on March 5, 2013 by Martyn. Be the first to comment! 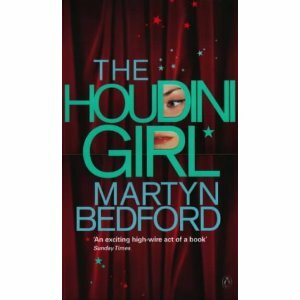 My novel, The Houdini Girl, has made it into film nearly fourteen years after it was first published. The novel has been under option to a production company for most of that period, with a script written by writer/director Kfir Yefet, and it has come close a couple of times to being made into a full-length feature. In the latest development, a short film has been shot showing a key scene from the novel with a view to attracting funding for the whole movie. 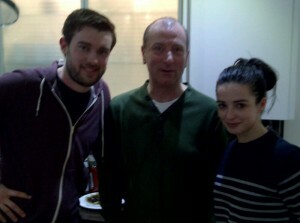 I went down to London recently to watch some of the filming and had a chance to meet the two lead actors – Jack Whitehall, stand-up comedian and star of the TV series Fresh Meat, and Laura Donnelly, an experienced TV, theatre and film actor whose recent credits include Dread, Merlin, Missing and The Fall. Jack and Laura play Red and Rosa in a bedroom scene at the start of a tempestuous, tragic relationship. It was fascinating to get a behind-the-scenes glimpse of a shoot and to be on set while two actors brought the characters from my fiction to life before my eyes. The ten-minute short is a fine piece of work by all concerned, from cast to crew, and a creative coup for Kfir, who has kept the flame burning for this project since the beginning, despite the many setbacks that befall the transition of a novel from page to screen. The aim is to show this film at festivals and to use it as a pitch to secure the backing needed to get a feature-length movie into production. The short was made by Tomori Films, written and directed by Kfir Yefet and produced by Ofir Kedar and Guy Allon. Click here for a link to the International Movie Database (IMDB) website for details and a full list of credits.